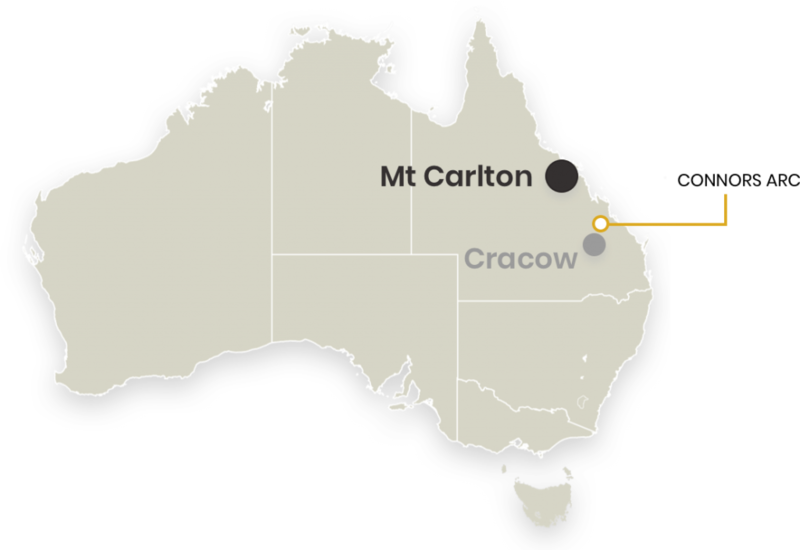 Connors Arc is a large early-stage Greenfields exploration project located between our Mt Carlton and Cracow operations. 100% EVN, acquired in May 2018 from Orion Minerals Ltd. The Connors Arc Project straddles the Connors-Auburn Arc, a continental margin volcanic arc of Carboniferous-Permian age on-lapped by the Permian Bowen Basin. The Connors – Auburn Arc is known to be prospective for, and host to, multiple styles of economic Au mineralised zones, including high-sulfidation epithermal gold (Mt. Carlton EVN 100%) and low-sulfidation epithermal gold (Cracow EVN 100%). Target Work to date at Connors Arc is all early stage and low impact exploration work. This work has included an airborne hyperspectral survey, geologic mapping and rock chip sampling, soil sampling, stream sediment sampling and ground magnetic surveys. This work is designed to generate new targets for drilling, as well as assess existing prospects. An airborne hyperspectral survey has defined several new alteration zones that show similar alteration assemblages associated with gold deposits in the district. These alteration zones are being followed up on the ground by Evolution geologists.